So I know we are all blabbing about the human microbiome, who isn’t fascinated by the impressive roles tiny microbes have in our lives!? Trying to unravel what exactly our microbial communities do for us, and how they relate to our health is a pretty interesting challenge that we will (…I’m optimistic) figure out. However, we aren’t the only ones on the face of this beautiful planet that matter, as I’m pretty sure everyone knows. Our microbial symbionts do a bunch of important things, and it’s become clear that not only is their part in our lives (and other organism’s lives) essential, but also not well understood and quite variable among different species. It definitely doesn’t help that we have to rely on new and fancy sequencing techniques just to begin the process of characterizing the bugs that have such a big influence in our lives. There are plenty of actual bugs (not bacteria) that play a big part in making our planet keep going, in particular, the honey bee (Apis mellifera) is an ideal model for studying host specific microbial communities. These bees exist in large colonies mainly made up of female workers and reproductive queens. Interestingly, as summarized by a recent review in Nature this week by Kwong and Moran, the worker bees have a gut microbiota made up of just 9 species clusters. Crazy enough, we can culture all of the main microbiota that live in bee guts, while it is pretty tough to culture the majority of mammalian gut microbes. It is often the case that in order to unravel more complex systems, it’s best to start with simpler versions. Honey bees transmit gut microbiomes, they are generally characterized by communities that have been adapted specifically to their hosts and they also grow best under oxygen concentrations lower than that found in the air (just like our microbiomes!). In contrast to humans, however, bee guts harbor about 9 species clusters and manipulation of these microbial communities is pretty darned easy. Granted, these groups are defined at the 97% operational taxonomic unit (OTU) level (using 16S rRNA gene sequences), and studies have found that this is maybe not always the best method to define species……regardless, even at this level, it seems that there is more of a diverse party going on in our guts vs bees. As is often the case, recent sequencing tools have made the analysis of these model organisms better and more affordable. Checking out a simpler system than our own might allow for more concrete conclusions to be drawn regarding which microbiota are associated with specific hosts and ecotypes, allowing us to paint a beautiful picture of the adaptations that microbial communities have developed to thrive in a unique and distinct niche. This could be an important step in understanding the link between phenotype and genotype, ultimately elucidating the nucleotide changes responsible for specific physiological abilities. This recent review is interesting for a variety of reasons, in particular, honey bees are essential to all of us all over the globe. They are key in pollinating essential crops, and maybe the recent decrease in bee populations, which has been in the news lately, will allow us to figure out how to improve bee health as well as drive interest in clarifying symbiotic relationships that are important for all of us to understand. What a beeautiful system to study (sorry, had to do it). Kwong, Waldan K., and Nancy A. Moran. 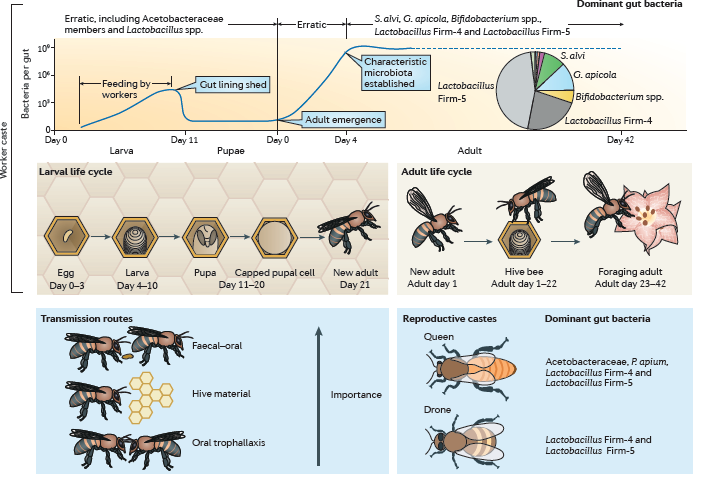 “Gut microbial communities of social bees.” Nature Reviews Microbiology (2016). 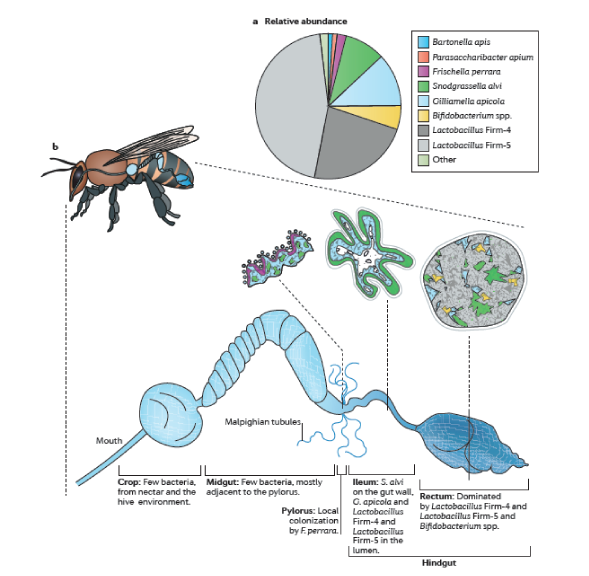 This entry was posted in Coevolution, community ecology, evolution, genomics, metagenomics, microbiology and tagged bee gut, host-specific bacteria, microbiota. Bookmark the permalink.